A friend of mine told me while we were playing one day, that someone looked into how it is that Justin Thomas, who isn’t a very big guy, drives the ball so far. One of his keys is that he hits the ball on the center of the clubface. Every time. It might have been on impact tape or something, but the impression after a good number of drives was about the size of a quarter. How does he do that? I can’t say how his swing makes that happen, because I don’t know. But I can say for sure that one thing which makes it happen is his setup. I’ll bet dollars to donuts that he sets up the same distance from the ball every time, the ball is in the same place in his stance every time, his posture is the same every time, his hands are in the same place every time, and so on. I would also bet that if you took a picture from the same spot every time and overlaid all those photos on top of each other, you wouldn’t see much leakage, if any, around the edges, if you know what I mean. By starting out in the same place every time, in every respect, Thomas gives his swing every chance to return the clubhead to the ball in the same place every time. 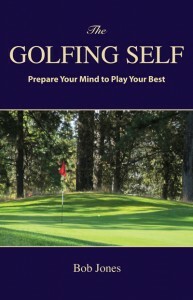 Here’s an example taken from the book, The Search For the Perfect Golf Swing. 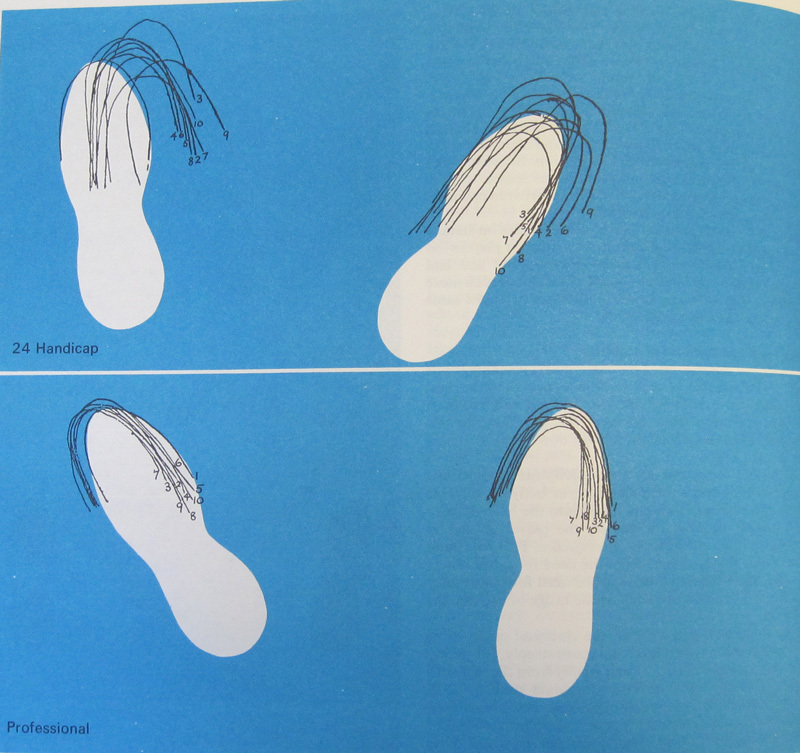 It shows the variation in foot position in a 24-handicapper and a professional golfer. The pro is consistent, and the amateur is all over the place. Was else I can tell you for sure is that a major cause of inconsistent ball-striking is an inconsistent setup. I would go so far as to say you should practice your setup as much as you practice your swing. Let’s drill in on this point. Say you hit a tremendous drive. 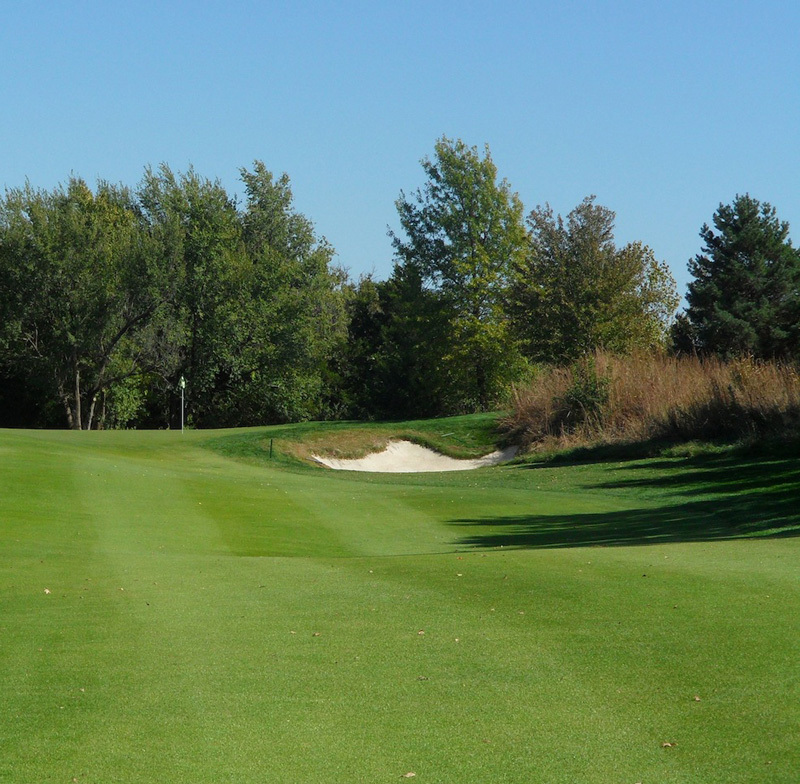 On the next hole, you unknowingly set up with the ball one inch farther away from you than it was on the last hole. If you make the same swing, you will miss the sweet spot on the clubface by an inch. But you won’t make the same swing, because you’re reaching out a little bit farther than you did last time and that is enough to change everything. Your unconscious mind knows you’re out of position and will try, in vain, to compensate. You won’t hit anywhere near as good a drive and then wonder what happened to your swing. What happened was that an inconsistent setup forced that good swing out of existence. Simple as that. My instructor had me buy a four-foot metal ruler to practice my setup. With this, you can ensure your feet are the same distance apart, and the ball is in the same place. 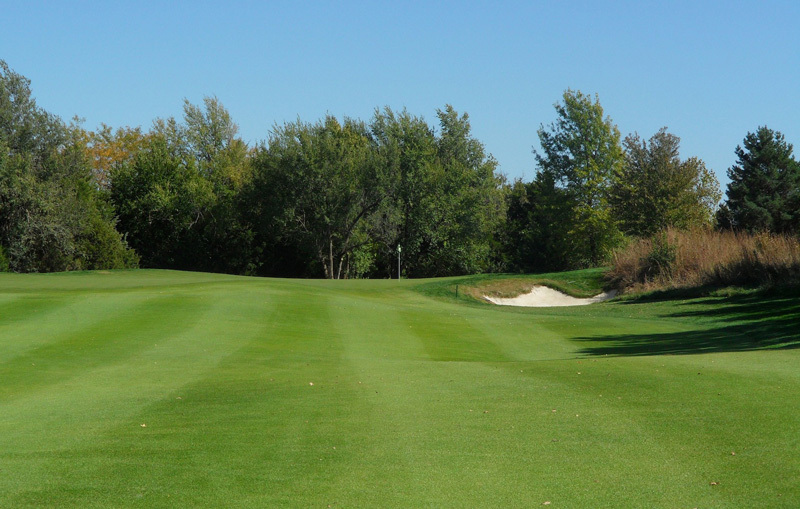 Being consistent with these two things alone will by themselves improve your ball-striking. We practice our swing to make it as much the same as we can every time, but what’s the use of having a repeating swing if your setup is all over the map? And when you’re trying to develop a repeating swing, you might keep correcting this or that when your swing is just fine and it’s your setup that needs work. * This will vary by the club used, must be the same per club. You know what the red line is. 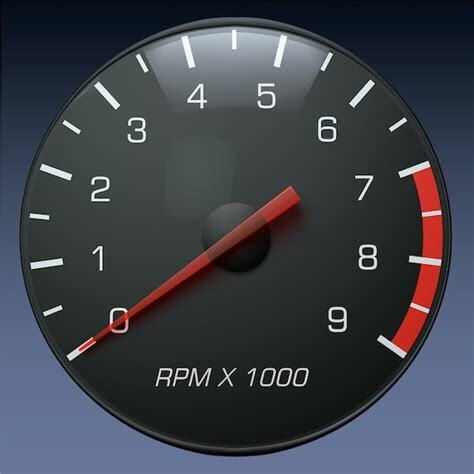 It’s the line on the tachometer of your car that you dare not rev the engine beyond unless you want to ruin it. Shift, already! Your golf swing has red line, too. Keep your swing speed under it, and your swing will perform the way it is supposed to. Exceed it and, well, . . .
Before I go on, let me be clear that when I say swing speed, I mean how fast you pivot and swing your arms. That’s not the same as clubhead speed, which usually refers to the velocity of the clubhead as it hits the ball. This post is about swing speed. Another name for that is tempo. It might seem that if you want the clubhead to be moving faster when it hits the ball, you need to move faster, too. Although there can be a direct relationship between swing speed and clubhead speed, there can be an inverse relationship. Oh sure, if you watch many modern Touring pros swing, they swing hard and fast and hit the ball way out there. But we’re not them. If most of us tried to swing as fast as they do, our body would get so tight that we would actually slow down the clubhead. When you swing at a speed that is right for you, and it’s not going to be as fast as you can, the clouds part, the sun shines down upon you, the violins swell, and golf becomes a simple game. In my earlier writings, I said to find your swing speed (tempo) you should start slowly and speed up until you have gone too far, then back down. Now I want to suggest trying the opposite approach. 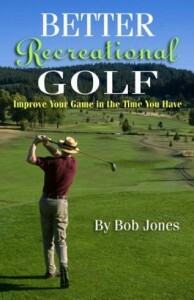 Go to the range, and after you have thoroughly warmed up, hit balls with a 6- or 7-iron, swinging as fast as you can and yet stay in reasonable control of the goings on. Hit maybe a dozen balls this way. Be sure to rest in between shots. I will not be surprised, though you might be, that the slower swing speed dramatically improves your ball-striking. You make much better contact than before, get better ball flight, the ball goes in a consistent direction, and you get pretty good distance. Did I leave anything out? I got a call from The Golf Channel a few weeks ago saying they liked my blog and would I like to be a guest on The Golf Fix. I said, sure. They said bring three things to talk about. I said that would be easy. So when Michael Breed asks me what I have for the viewers, I will mention three things that if every golfer could do them, the sound of the nationwide crash of handicaps plummeting would be enough to put the National Guard on alert. Faithful readers of this space should already know what two of them are. The first one is rhythm and tempo — 3:1 rhythm from takeaway to impact, at a tempo that lets you get the center of the clubface on the ball. The second one is the hands lead the clubhead into impact. This leads to mastery. The clubhead getting to the ball first leads to one disaster after another. 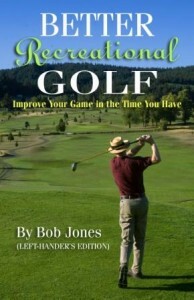 The third one is to replace your urge to hit the golf ball with the joy of swinging the golf club. If there’s a ball in the way of the swing, so much the better. Then I would show drills you could use for each point. To get rhythm and tempo right, just count as you swing. 1 is the moment of takeaway, 2, 3, 4 to the top, and 5 at impact, performed at a pace (tempo) that, to you, feels unhurried. For the hands leading the clubhead, I demonstrate drill from Harvey Penick’s Little Red Book on swinging down slowly to hip level three times and on the fourth, at the same speed, continuing down and through the ball. I would say, Do each of these drills for two minutes every day (six minutes, total), and see what you get after 60 days. Then I would look at Michael, who for once would be speechless. After all, what more would there be to say? This is what I’ll present for my guest spot on The Golf Fix. But you don’t have to wait. Start doing these three things right now, and let me know in 60 days how it came out. So when will my fifteen minutes of fame be on the air? Well, unfortunately they had the wrong number. When they realized who they were really talking to, they apologized and hung up. I guess all this will remain our little secret, and my little fantasy.